Rajdeep asks cops the matter. Cops ask him if he beat up his wife and taking her forcibly. Mouli says he is a liar. If you dont believe me, ask everyone in the market. Rajdeep says why market, ask my wife. He drags Mouli out of the car and cops ask her the truth. Mouli reassures Nandini to tell the truth. Rajdeep too asks Nandini to tell the truth. Nandini is shaking in fear. Mouli says if u lie, then u will end up defeating all women who are abused by their hubbies. Mouli keeps telling Nandini not to be scared, she is with her. Cops say nothing amiss here. Rajdeep asks Mouli to excuse them and takes Nandinis hand in his and pulls her away. Nandini gets flashbacks of past and recollects Kunals words and Rajdeeps threats and Moulis reassurance. Just as Rajdeep is about to make Nandini sit in the car, she calls out to the cops. Rajdeep fumes on her but Nandini rushes to Moulis side. She tells the cops that Rajdeep is my hubby but he beats me everyday and today also. Rajdeep tries to confuse Nandini. Nandini tells everything and says she is scared of Rajdeep. Cops arrest Rajdeep who glares at Nandini and Mouli. He says i will remember this and will remind you too, when time comes. Cops take Rajdeep away. Mouli hugs Nandini happily and says so proud of you. Mouli is making kheer. Kunal asks why? Whose birthday. Mouli says someones birthday for sure. Mouli calls everyone to the dining table. All ask the matter. Mouli says today is Nandinis birthday. Kunal is confused. Mouli shares how Nandini has discovered her inner strength and walked towards light. She has sent Rajdeep to jail. All compliment Nandini and Kunal shakes hand with her and twirls her around. All sing 'Happy Birthday' to Nandini. Dida says party time. She asks to order chinese food. Kunals mom says take any saree from me. Mouli asks Nandini which chinese she wants to eat. As Mouli is about to order, Nandini breaks down. All are confused and Kunals mom says she is happy. Mouli says u scared me so much. Nandini says never seen so much love. Mouli says u will see it everyday here. Mouli asks Nandini to stop crying and eat kheer before Kunal eats everything. Kunal stops midway eating kheer and says for Nandini and offers to her. Kunal says wanna kill Rajdeep. He says hope he is in prison for long. Mouli says lets get divorce papers ready for them. Nandini is in tears in her room. She recollects about getting Rajdeep arrested and his threat. 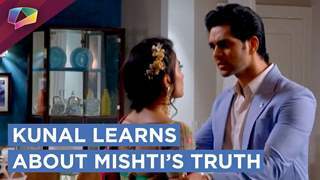 Mouli tells Kunal that till they divorce she will not be free for real. Kunal says let it be Nandinis decision. Its not an easy case. Mouli says its a different case. 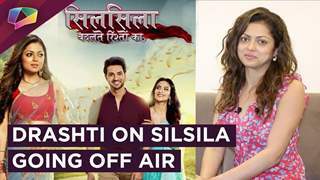 Kunal says marriage is a special relation and people cant breakup so easily. Nandini looks at her mangalsutra and tries to break it up but cant. Nandini wonders if she will ever be free from this. Mouli says true but if marriage is not a bond but barrier then it is to be broken. Mouli says Nandini has taken a first few steps to freedom, she will agree. Kunal says ur stronger than her so u can say all this. Mouli says Nandini is stronger than me. Kunal is busy reading when Mouli turns to him and says our marriage is the best. Kunal says lets kiss. He switches off the lights. Next day morning, Mouli gives Nandini a writing pad and Kunal gives her a pen. They say what u want to do in life, start writing it like a bucket list. Its a fresh beginning. She asks what list? Kunal says like a shopping list of ur dreams. 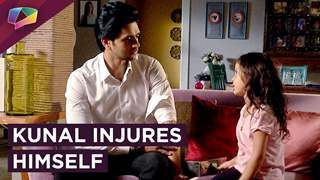 Kunal and Mouli turn to leave for work when Kunal comes back and tells her that she promised to him that she will give life a chance so she should give life a chance and write it on the paper. Nandini writes dance but scribbles it off. Later in the day she is sitting holding the pen. Kunal comes and wishes her and asks about her day. Nandini says going to make tea. Kunal says show me the list. He finds the word Dance written and scratched off. He says must be busy. Lets make a list now. Else Mouli wont spare. Kunal asks what is at no. 1? What do u like? Think of life as a store and sections like food/travel. Tell me where u want to go? Nandini says i never shop for myself. She asks about section on saree. Kunal says its a bucket list, write things u have never done. He says he did choose food. He asks Nandini her choice. She says what all want. Kunal says something u havent tried, think. Nandini makes a puppy like face. Kunal asks Nandini about pizza with cheese. He asks her if she wants to eat? She nods. He writes that down. He asks about her dreams and says he dreams of food only. He says want to eat flaming pan? She nods, he writes that down too. He asks her what she wants to eat. His mouth is watering. Nandini smiles. Mouli reads the list and its all about food. Kunal tells her great choice Nandini. Mouli asks is it Nandinis list or Kunals? Kunal says i took Nandinis opinion, Nandini too agrees. Mouli says u making her lie now. Mouli asks to write down something her own. Nandini says din think anything. Kunal shows the scribbled word. Nandini excuses herself. Mouli wonders what that is? Precap --- All are eating burger. Then Mouli takes Nandini for mehendi. Mouli goes to show her mehendi to kunal when Nandini overhears the name Rajdeep and is terrified. Thanks for the written update! !